Soft Cover, 194 pages, 5.75 x 7.5. First created in Munich in 1894, it is perhaps the most delicate beer imaginable, and must rely on its incredible subtlety to please the palate. Munich's famous beerhall helles, the palest of lagers, has almost no nose or up-front bitterness. Straw blond and topped by a tall, white crown, it is the quaffing beer of the Bavarians. As authgentic as his subject, Hornst Dornbusch captures the spiirit of this lovely brew with accuracy, warmth, and wit. And for the Munich helles, although not as widely known as other German lagers, its future in North America may have only just begun. 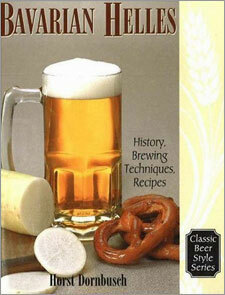 Brewers will treasure this book, as will beer enthusiasts who want to learn more about it.